Although Wait Wait… Don’t Tell Me! officially reached their first 20th anniversary milestone back in January of this year, the show has been celebrating their anniversary throughout the year and have had a number of shows on the road as part of their 20th anniversary tour. On October 25th, they had their 20th anniversary extravaganza at The Chicago Theatre in downtown Chicago, their fair city. Months prior to the special show, I had already worked out plans to travel to Chicago for the big show. The anticipation and excitement continued to build as the date got closer and started peaking when I landed in Chicago a few days before the show. Thursday evening, I made the short walk from the hotel to the Chicago Theatre to pick up my tickets at the box office and anxiously waited for the doors to open. During that time, I checked to see where I was going to be seating and saw that it was on the main floor and about 10 rows back from the front. While waiting for the show to start, I was trying to see if I could recognize anyone that I’ve met at previous shows and/or anyone that follows Luke Burbank’s podcast, Too Beautiful to Live. Alas, I didn’t recognize anyone. At 7:30 PM Central Time, the show was about to start and there were two people, one from WBEZ and one from the show’s sponsor, Wix.com, that thanked everyone that came to the show. 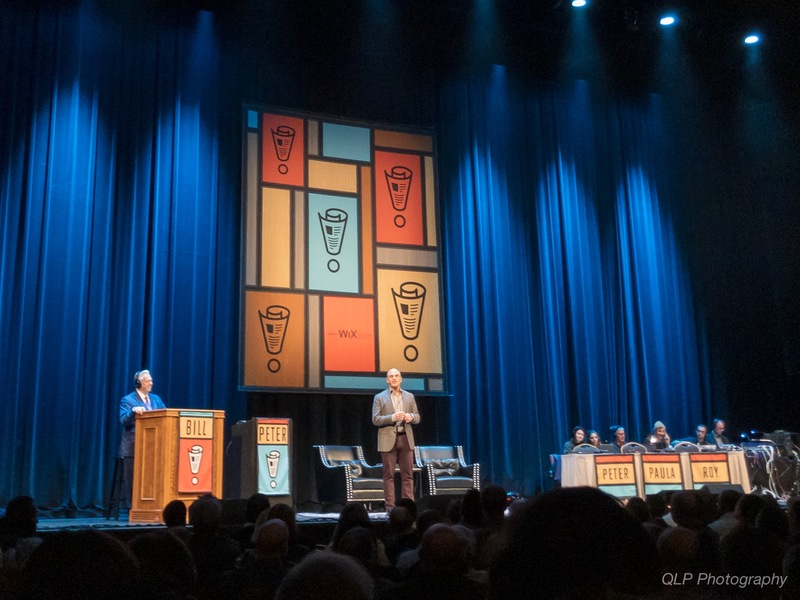 Afterwards, as with any other Wait Wait live taping, the lights went down and a multi-color spinning light show started up with Paul Friedman announcing the start of the show, along with Peter Sagal and Bill Kurtis. As part of the pre-taping part of the show, Peter reminisced a little bit about the show being on for 20 years and would then describe how the special show would work. Unlike a regular taping of the show, in which only three panelists would be on the panel, the special 20th anniversary show would have a rotating set of panelists that would change up throughout the show. Peter Grosz, Paula Poundstone and Roy Blount, Jr. would be the panel for the first segment, Who’s Bill This Time? For the first panel round, the panel consisted of Tom Bodett, Roxanne Roberts and Maz Jobrani. For both the Bluff the Listener and the Not My Job segments, Amy Dickinson, Mo Rocca and Faith Salie were on the panel. Afterwards, Adam Burke, Negin Farsad and Adam Felber would be the panel for the second panel round. The panel changed again for the Listener Limerick Challenge segment, consisting of Tara Clancy, Luke Burbank and Brian Babylon. Below is a breakdown that I created, listing each segment and panelist, and whether they answered a panel round question correctly. Also, I have noted which panelist had their Bluff the Listener story chosen and which one had the correct story. After each panel rotation, they would ask each panelist a question relating to something related to something they did or thought 20 years ago as a means to make sure the recording levels were good and that there weren’t any issues with the headsets. Even with that bit, there were still a number of technical difficulties with the panelist headsets working properly. Sometimes, the microphone would cut out and they would have to spend a moment or two to fix them. This can be attributed to having to switch panelists a lot more often than usual. When it came time for the Not My Job segment of the show, NPR legends, Nina Totenberg and Robert Siegel, who have been on the show a couple of times, especially during the first few years where most of the guests were other NPR journalists and personalities. For this special show, they really changed things up for the Lightning Fill-in-the-Blank segment. They had brought back all of the panelists back on stage and there would be three teams of five panelists that would each be answering one Lightning Fill-in-the-Blank question. For each team, there was a team captain that was chosen based on being the panelist with the most losses on the show. Peter mentioned that they determined that based on data from my Wait Wait… Don’t Tell Me! Stats Page. By the way, that will be brought up again later. Due to the unique nature of the rotating panel and the special panelist teams for the Lightning Fill-in-the-Blank, I will not be keeping track of the various points that each panelist would have accrued during the show. Instead, I refer you to the following breakdown of which panelist answered their Lightning Fill-in-the-Blank question correctly and the totals for each team. Both items above can be viewed in their original format in a Google Docs spreadsheet that I have published publicly. Once the segment was completed and they wrapped up the show, without the usual Panelist Predictions segment due to the number of panelists and Peter doing a few pick-ups, Peter introduced everyone involved with the show’s production and logistics team on stage. Before Peter finished, he made a callback to the mention of the Wait Wait… Don’t Tell Me! Stats Page when they were setting up for the Lightning Fill-in-the-Blank segment. At which point, he mentioned my work on creating and maintaining the site for many years and that it has been a resource that they have used over the years. At which, he was looking for me in the audience, I stood up and they brought out a framed poster featuring special artwork for the 20th anniversary and it had been signed by everyone on the show. I was surprised and amazed that they said that it was for me as a thank you for all of the work that I’ve put it and continue to put into the site. After that, the show wrapped up and people came by to say hello and to thank me for the work on the site. I was then taken backstage to meet and mingle with everyone on the show and those behind the curtains, so to speak. Thankfully, I also learned that they would be shipping the signed and framed poster to me, rather than having to carry it around with me and fly it back home. Unfortunately, I didn’t get a chance to look at it up close by the time I got backstage. Between the banter between segments, some of panelists really hamming it up (including the number of times that Paula interrupted Peter or when Mo Rocca did a cartwheel while holding a drink), and some of the surely-will-be-edited-out blue comments and quips, the experience of being at the live taping of the 20th anniversary extravaganza was one of the best experiences that I’ve had of any live taping of any show that I’ve been to. 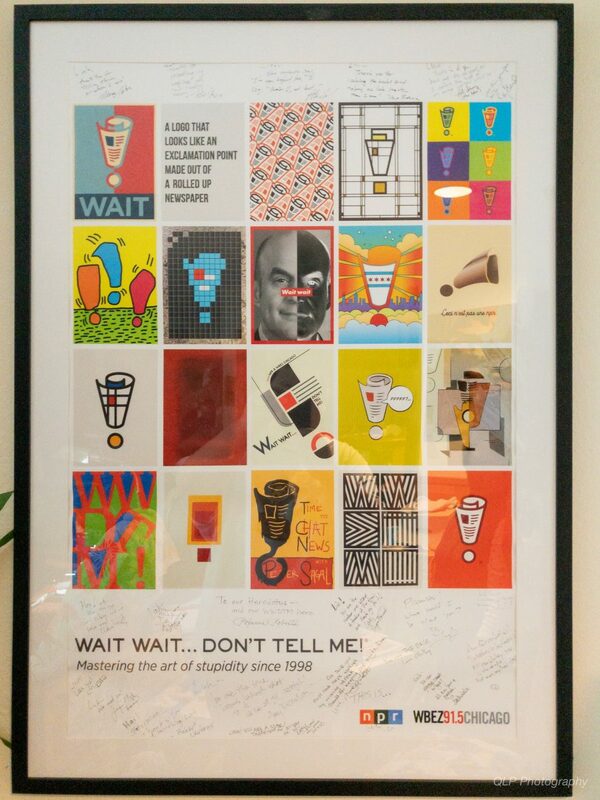 20 years is a huge milestone for Wait Wait… Don’t Tell Me! and the show lived up to and exceeded my expectations. It was great to see many of the current panelists on stage and to hear memories from the earlier years of the show. I am entirely humbled by the experience and for the appreciated that was heaped upon me for my work on the Stats Page. I want to thank the Wait Wait… Don’t Tell Me! crew, WBEZ and NPR for all of the hard work in preparing for and producing the extravaganza. I also want to add a special thanks to Colin Miller for making sure that I could come out to Chicago and be part of the show.